Wilbur J. Mathurin, P.E. has been with Hoyle, Tanner since 2001 providing management and engineering services to our clients throughout Florida. Securing a MS in Engineering Management as well as a MS in Civil Engineering, Wilbur is focused on providing innovative and sustainable aviation and stormwater design services to our clients. Throughout his longstanding career, Wilbur has demonstrated an ability to manage multiple staff resources and specialty subconsultants on complicated aviation and transportation projects. Congratulate Wilbur at (407) 380-1919 x *820 or wmathurin@hoyletanner.com. Jon A. Olin, P.E. joined Hoyle, Tanner in 2010 as a Senior Structural Engineer. Serving as a technical team leader over the last four years and as Manager of our Transportation Services Group in Vermont for the past two years, Jon provides structural and civil engineering services for our municipal and state agency clients throughout the northeast region. For much of his career he has served as a Project Manager demonstrating his ability to lead successful teams for large and small projects. Congratulate Jon at (802) 860-1331 x 314 or jolin@hoyletanner.com. Jason M. Ayotte, P.E. started his career over 14 years ago with Hoyle, Tanner and was happily welcomed back in 2013 to lead and support projects in our Transportation Services Group. Jason’s experience on several high profile transportation projects strengthens our team’s ability to develop innovative solutions to construction challenges our clients face. His career has focused on transportation and utility design, stormwater and water quality solutions, and constructability of projects throughout New England. In addition, Jason has been extremely active and committed to professional development of himself and others, while serving leadership roles within the American Society of Civil Engineers. With his energy, drive and passion for engineering success, Jason is dedicated to meeting the overall project objectives. Congratulate Jason at (603) 669-5555 x 126 or jayotte@hoyletanner.com. Jean E. Mongillo P.E. originally began her career as an Airport Engineer 30 years ago. She started with aviation design and permitting projects for various clients throughout New England before her recent transition into the Manager of Aviation Business Development for the Northeast region. Having led multiple projects through design and construction, Jean works with current and potential clients to maximize efficient and affordable capital improvement opportunities as well as streamline projects through the FAA process. Congratulate Jean at (603) 669-5555 x 168 or jmongillo@hoyletanner.com. 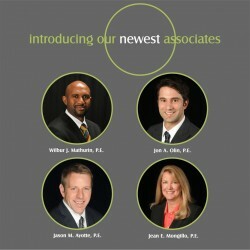 On behalf of our Board of Directors, please join us in congratulating our newest Associates!